Boulder City Parks and Recreation Department’s men’s league basketball is finishing its second round of play on Tuesdays and Thursdays through February. Games begin at 6:30 p.m. in the new gymnasium. (Kelly Lehr) Boulder City Parks and Recreation Department donated $240, the proceeds from its holiday dodgeball tournament, to Emergency Aid of Boulder City to help stock its pantry. 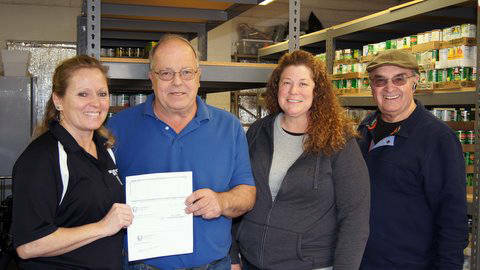 Here, from left, Kelly Lehr, sports coordinator for the Parks and Recreation Department, presents a check to Emergency Aid President Tom Tyler, Office Manager Bridgette Terrill and Pantry Manager Don Taylor. Wasted Talent, which is new to the league this year, is in first place with big 3-point scoring this week from Chris Click and Matt Rapp. Slow and Steady, led by Kodiak Yazzie, and Flight S2S, led by Rob Sandoval and Vemon Clemons, are tied for second place, said Kelly Lehr, sports coordinator. High scoring from B.C. Kids’ Jaylene Brown and Woodbury Law’s Jordan Peel have those teams in a tight race for fourth place. High scoring from Tyler Bletsch and Jonas Hernandez from the Credit Union and Ryan Emling from Judge Joe’s Jury this week have both teams in the running for sixth place. The Katz, despite big scoring from Kris Woodard, is trailing the league. Competition is heating up this season with teams from Boulder City, Henderson and Las Vegas alternating in the spotlight from week to week. The Parks and Recreation Department is accepting registration for adult kickball. The coed league begins at the end of the month. Games will be played Sunday evenings through March at the Hemenway Valley Park ball fields. Contact Lehr at 702-293-9254 if you have a team interested in participating. The department’s youth basketball league has concluded for the 2019 season. The fifth- through seventh-grade boys league ended its season with a showcase of talent during halftime for the Boulder City High School game against Sky Pointe on Monday, Feb. 4, evening. The Longhorns, coached by Mike Flake, played the Wildcats, coached by Brandon Barrow. The Warriors, coached by Jared Bohanan, played The Gators, coached by BCHS varsity basketball player Mason Hood. The boys got to experience play on the big court and drew praise from the varsity coaches, Lehr said. The kindergarten through second-grade hockey league is in season through March. Teams play every Saturday morning and early afternoon in the old gymnasium at the city’s Recreation Center, 900 Arizona St.
Third- through sixth-grade hockey is accepting registration for its March through April league, which will be played Monday and Wednesday nights.